Usually, the crew for a space shuttle mission is as diverse as the cast of a "Star Trek" movie. But this time? Not so much. 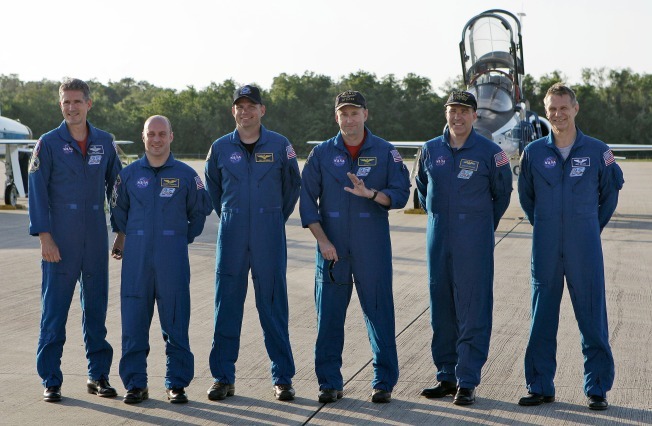 All six of the astronauts chosen for the shuttle Atlantis' final scheduled flight to the International Space Station, known as STS-132, are men. All of them are from NASA's own astronaut corps as opposed to other countries (although one is a British-born U.S. citizen). Perhaps most importantly, all of them have flown on the shuttle before. STS-132 commander Ken Ham says having no rookies on the flight has made some things easier for the crew. "It makes it really easy for me to make positive argument deals, if you will, with the training side saying, 'Hey, we don’t need to do this particular training here. We’ve all flown before,' and typically I’ll be allowed to win those arguments," he said in a NASA interview. "That simplifies our life and makes it easier to go forward." The main objective for Atlantis' 12-day mission to the space station is to deliver and attach Russia's Mini Research Module 1, also known as Rassvet ("Dawn"). Spacewalkers are also switching out six batteries on the station's power-generating truss, and transferring a spare communication antenna. Tons of supplies are to be transferred during the shuttle's visit to the station. Personal: Born Dec. 12, 1964, in Plainfield, N.J. Married with two sons. Nickname: Hock (as in "ham hock"). Experience: Naval aviator and test pilot who flew combat missions over northern Iraq and Bosnia. Selected to become astronaut in 1998. Served as pilot for Discovery's STS-124 mission to the International Space Station in 2008. Quote: "The part about its being [Atlantis'] final flight truly is irrelevant to me. One, you don’t know if this is the final flight or not, and it has no more importance than any other flights. They’re all incredible. The legacy itself is unbelievable. ... It launched Magellan, Galileo. It’s been to Mir seven times, something like that. It delivered the [Quest] airlock and the [Destiny] lab. [It was the last shuttle to service] Hubble. This incredible machine has done so much for humanity that it’s ... I don’t know how you could describe it." Personal: Born in Detroit. Married with two children. Nickname: Tony (as in "Antonelli"). Experience: Naval aviator aboard USS Nimitz, flew F/A-18C Hornets in support of Operation Southern Watch. Selected as astronaut pilot in 2000. Served as pilot for Discovery's STS-119 mission to the space station in 2009. Quote: "It’ll be interesting to see where we go next and then on after that. I think all of the space shuttles will be fondly remembered for their contribution to getting us started. I do think that’s the future: traveling around from world to world. It will be exciting to get on with it. Space shuttles will be remembered for quite some time for their role in the whole 'getting us going' part." Personal: Born in Parma, Ohio. Married with three children. Nickname: Bueno (as in Spanish for "good"). Experience: Air Force test pilot and operations officer. Flew and tested the B-2 Stealth bomber. Selected to become astronaut in 2000. Participated in two spacewalks during Atlantis' STS-125 mission to service the Hubble Space Telescope in 2009. During STS-132 spacewalks, Good wears a suit with barber-pole stripes. Quote: "For all this time leading up to the Hubble flight, I was always an unflown rookie and so there were some of the unknowns that go with that. So now it’s great to be able to say, 'Yeah, I went up on STS-125. We went to the Hubble Space Telescope, did a great servicing mission on it.' It was very successful and now I’m really looking forward to this flight having had that experience." Personal: Born Feb. 10, 1968, in Morristown, N.J. Nickname: Big G (Garrett is the shortest member of the crew). Experience: Earned Ph.D. in mechanical engineering from Caltech. Employed as engineer at TRW, where he designed the thruster-based attitude control system for NASA's Aqua satellite. Selected to become astronaut in 1998. Launched to space station on Endeavour in March 2008, spent three months on station and returned to Earth on Discovery in June 2008. Reisman wears an unmarked spacesuit during spacewalks. Quote: "The space station really is a wonderful place. It’s really big. People ask me all the time, 'How did you feel cramped up in there for three months?' I didn’t feel cramped up at all. ... It’s so large that on two different occasions, I went looking for one of my crewmates and I couldn’t find him. I started one end of the ship, went all the way to the other and had to double back and try again because it’s that big. So it was great living up there. And you have the views of the earth, of course, looking out the window. It was really a great three months." Personal: Born Feb. 13, 1964 in Cohasset, Mass. Married with three children. Nickname: Steve-O. Experience: Served in the U.S. Navy on several submarines. In 2000, he became the first submarine officer selected by NASA to become an astronaut. Flew on Endeavour's STS-126 mission to the space station in November 2008. Bowen wears a spacesuit with red stripes during spacewalks. Quote: "I went on submarine cruise one summer while at the Naval Academy, and I had never really been on a submarine before. We met a guy, there were two of us who were heading down the waterfront, and he said, 'The thing that will strike you at first is the odor.' And sure enough, you get on the boat and it has a very distinct and peculiar odor. But you get used to it real fast — and I just thought it was ironic, because that was the first thing I noticed when I crossed over to space station on 126. It had that hint, that little scent that was 'this smells like a submarine.'" Personal: Born April 11, 1955, in Crowsborough, England. Married with two children. Nickname: Eppy. Experience: Received doctorate in biometeorology from Leeds University in 1981. Conducted research on the interaction between Earth's biosphere and atmosphere. Selected to become astronaut in 1996. Flew on Atlantis to the space station in 2002, and was part of NASA's second "return to flight" test mission aboard Discovery in 2006. Sellers is taking the lead role in operating the space station's robotic arm during spacewalks. Quote: "These missions seem to get more and more ambitious and complex, more and more tasks get done. I think it’s an interesting mixture of different tasks. Just delivering the Russian module, that’s going to be a challenge by itself. We’re putting somebody else’s hardware onto the station, and a lot of collaborative work has gone into this, but you never know how it’s going to work out. I’m sure it won’t be a completely smooth process. I’m sure there will be challenges."